The famous manuscript has been removed due to “a minor technical issue” and replaced with an exact replica. The Book of Kells has been removed from its display and replaced with a copy due to “technical issues”. The real book – the most famous medieval manuscript in the world – is expected to be returned to its case within a few days. The replacement is a fine art facsimile, which is an exact copy of the original. The museum is still open to visitors but due to the absence of the authentic Book of Kells, tickets are being offered to visitors at a reduced rate. “All other exhibits are on display, as usual, including the Brian Boru harp, the 1916 Proclamation, and our current exhibition celebrating Schrödinger’s famous “What is Life?” lecture series, including a signed first edition of the book”, she said. 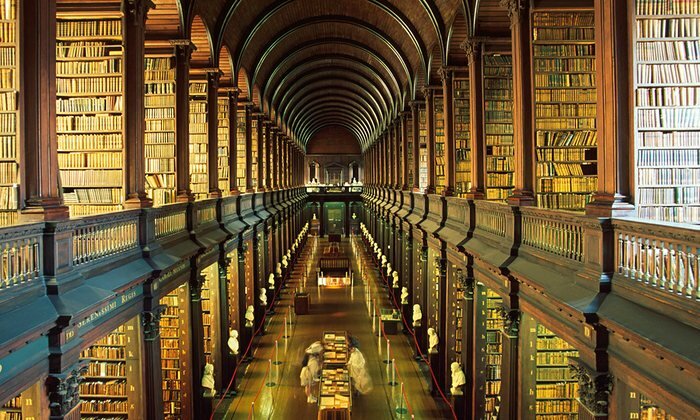 Housed in Trinity’s Old Library, the Book of Kells is carefully maintained, with the pages turned every six weeks to prevent light damage and to allow the public to view different sections of the book. The book is a hugely popular tourist attraction and a central source of revenue for the College. 454,000 people visited the exhibition in the first half of last year alone. This marked a 10.6 per cent increase on the number compared to the same period in the previous year, with the largest cohorts of visitors coming from the US, Ireland and China respectively. Since 2004, there has been an ongoing preservation project taking place to protect the collection in the Old Library. The project involves careful removal of dirt from valuable books, the replacement of leather, and making custom enclosures for fragile items. In recent years Trinity’s Preservation and Conservation department has also investigated pollution levels and other environmental hazards in the Old Library, which pose serious threats to the preservation of the collections.